In Scoville, you’ve got a job to grow lots of hot peppers and help the town make awesome chili recipes. You score points by fulfilling orders for peppers and making those recipes. Whoever scores the most points doing that wins. Get your overalls ready, it’s time to get spicy in Scoville! 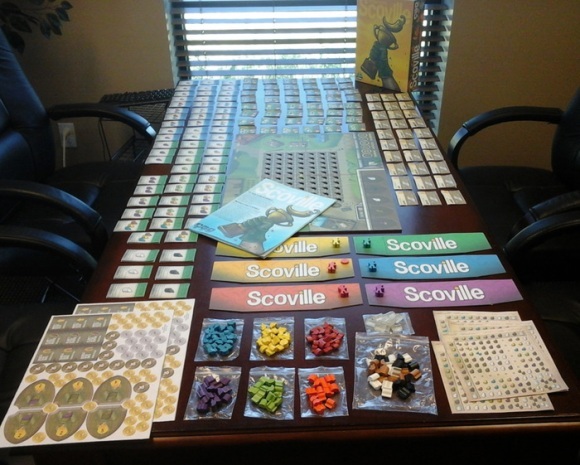 Scoville is fairly straight forward and isn’t hard to learn for an average gamer. Each round is easy with players bidding for turn order behind their player screens. Whoever wins the auction, gets to put their turn order token on the turn number. This is important, because the rounds after the auction have 3 phases that are performed in different turn orders. So, a player may want to go last sometimes to first in another phase. The first phase which goes in turn order allows players to pick peppers from the town square for planting first then plant one pepper in the field per player. Once all peppers are all planted, the players then harvest peppers in reverse turn order by moving their farmer tokens a maximum of three spaces. This is the brilliant part of the game. How you move your farmer between planted peppers determines the type of pepper you harvest. This is important, because there are different “levels” or value of peppers that are important for fulfilling recipes for points. The mix of peppers will a produce a certain pepper for a player to add to their collection. The last phase is fulfillment which is performed in normal turn order. Here the players take turns either selling their peppers at the Market for money, special peppers, and small amount of points in return or fulfilling hot recipes at the Chili Cookoff for extra bonus points or both. These phases continue until a certain number of cards in the Market or Chili Cookoff is less than the number of players. Then normally a final round is performed to end the game. Players then total their points to see how is the victor! The first time I played Scoville, I played with six players. It was long… like 2+ hours long. However, I still enjoyed myself which to me is a mark of a good game. I probably will not play six again, but I definitely do want to play it again and it is on my wishlist. I’m not sure about a two player game, since the strategic values of auctions seem more diminished. The game is very well produced. The cardboard bits are nice and thick. The artwork is great and very colorful. 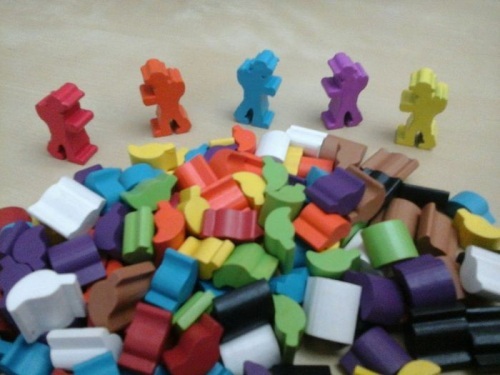 The pepper tokens are sturdy and have colors that pop. I also like how the pepper tokens have different heights based on their value and not just color. This adds a nice visual and tactile addition to the game. The player interaction is pretty good in Scoville between players bidding for turn order and blocking each other in the pepper fields. In fact, some might consider the blocking to be a little mean, because you can strategically place your worker to prevent someone from getting a pepper you know they want. I like! Overall, this is a really fun game! It provides really interesting decisions in the placement of both your peppers and your farmer. It allows for some long term planning, since everyone can see the market order cards and chili cookoff cards from the start of the game. It has some great player interaction. It’s just well put together! If you any of this sounds interesting to you… go get it! Family Gamer – YES – when the kids are little older. Colorful and fun. Strategy Gamer – MAYBE – does allow for long term planning by being able to see the available recipes, but has some random elements. Avid Gamer – YES – it’s just a fun game. Works well with different range of players. Power Gamer – MAYBE – not super deep, but may have enough interesting choices to involve a power gamer. Ah yes, the life of a farmer is often one of hardship. Often times, you have to decide which crops to grow every year. However, one such crop is known all over the world and that’s peppers. From the tame to the most extreme levels of hot, peppers is a fine little thing that everyone likes, maybe. Scoville is a game about planting peppers and getting different kinds of them for a contest on who has the best peppers. From fulfillment cards to making some recipes, Scoville is the kind of game that last place can very well mean first place. How will you handle the heat? By now, mostly everyone took the hot puns so it’s pretty cool here anyways. Over the series of rounds, players will be able to plant and harvest peppers. There are 5 phases of the game and each has their own rules as to what you can do. Plus, it’s important to understand this because player order is important! 1. Auction – The first thing players do is the auction phase *This doesn’t happen when the game starts, afterwards this phase begins in Round 2* To begin, players put whoever many coins they have in their hands and once everyone is ready, you reveal the coins to everyone. Whoever has the most coins will determine where on the turn order track they want to be. Once everyone decides, in turn order from left to right, you get to select one of the auction cards on top of the board to gain some extra peppers. Once everyone has chosen a card, we move to the next phase. 2. 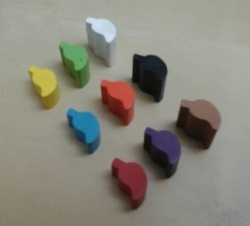 Planting – From left to right, players then choose one of their peppers to plant on the main board. The key thing here is that they must be horizontally or vertically touching another pepper in order to be planted. This is also where you earn award plaques if you were the first person to plant a certain pepper. 3. 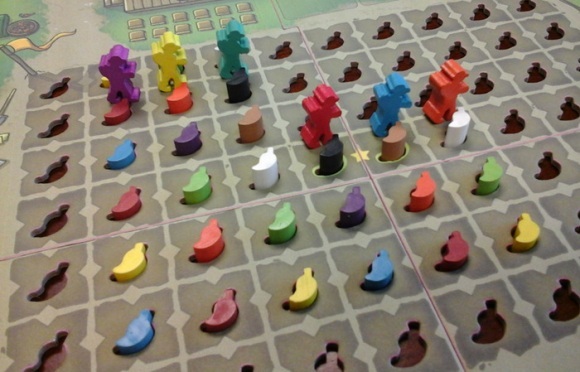 Harvesting – In reverse turn order, players then move their farmers on the board to gain peppers depending on what two peppers they can make. Players may move up to three notches (four if you decide to use one of your bonus action tiles). When in between two peppers, players look to see what peppers they make and gain that pepper from the supply and continue moving forward. Players can only turn around at the start of the their movement and never in between. Turn order is important because players can go through a player on the board so you have to go around players just to get to a space you want to go. Once everyone has made their move, we go to the next phase. 4. Fulfillment – This is where players can try to fulfill some goods to get some points back in return. While players can perform any of these actions in any order, they can only do each action once! -Visit the Farmers’ Market: A player can choose one of the market cards to see if they can fulfill them. They can range from giving you peppers, points or coins. -Compete at the Chili Cookoff: Here you can use a number of peppers to make recipes and earn points. The more peppers a recipe uses, the more points it’ll give you. -Sell a batch of Peppers: Each sold pepper you will net you $1 for every 2 of that colored pepper is on the board. This is more helpful towards later rounds once you start getting more peppers on the board. 5. Time Check – This is the final phase of the round to determine if we are at the endgame or if we switch from Morning to Afternoon. -If it’s Morning, check to see how many recipe cards are left. If there are fewer cards then players, then one more round is played and the game ends. If there are still more market cards then players, we are still in the Morning. If there are fewer, then we go into the Afternoon and we replace all the auction and market cards from the Morning deck to the Afternoon deck. -If it’s Afternoon, check the recipe and market locations. If one of them has fewer cards then players, then play one more round. If both locations have less cards then players, then the game ends without going another round. Once you determined what happens, another round begins until one of the above happens. Once everyone is finished, you count up how many points you have based on the market, recipe, award plaques and bonus tiles you have. Coins are awarded points for every 3 dollars you have, you get a point. 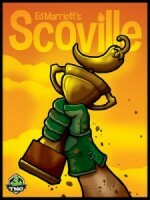 Whoever has the most points is the winner of Scoville! In an event of a tie, the winner is the one who has the most coins! Scoville is probably one of my favorite games made by TMG. Everything about the game screams theme and the peppers are just the best little components I’ve seen. The game itself is like a thinking game. You understand how to make more peppers but the key factor is that auction phase of the game. Do you go first to get more peppers or do you decide to go last in hopes to harvest the best peppers while prevent players from getting theirs? The choice is yours to determine where you want to go. The game allows you to get points from either the market or the chili cookoff so you can expand your options and get the peppers you want. Later in the game, you will start getting more of those complex peppers that can be worth big points at the end of the game. Each time you make a phantom pepper, you see how much work you placed into getting that. Those bigger recipes call for using more rare peppers and it’s often very hard to get what you want because other players went on your space on the board. This is where money can be a big hindrance to players because you get money from completing market cards but it isn’t that much. So often times, you have to bid smart in order to get what you want. And that could mean coming between first and last and your goals could change depending on where you go. If I can mention one thing about this game is that this is a fun game that isn’t that heavy. It does make you think but it won’t take you hours to complete the game. It’s simple to understand the rules once you get a few rounds in and players will start talking out loud about what they want to do. I remember in one game a friend was taking a while to decide what they want to plant. Thankfully the game comes with those breeding charts or it would take forever to finish the game. Often times, you have to really think about what you want to do but players could plant brown peppers on the board to mess up the field. This is because brown peppers can’t make other peppers and are the loser peppers of the world so if you plant them next to peppers that can make other peppers, you might as well try planting at a different area to get those good peppers. Scoville is probably one of my favorite games from TMG (and I like Belfort and that’s a bit more of a heavier game then Scoville). The fact that you plant peppers and make other peppers is really great and once the game ends and you see the board, that’s a lot of hard work for just peppers. Everything about the game is wonderful and the peppers themselves won my heart over. This is a fun little game that can be great for other players to enjoy very much. While some players complained about the bidding aspect of the game, I like it very much just so that it gives a sense of luck with who gets to determine their player order first. But remember, its not always the first or last player to gain the victory. 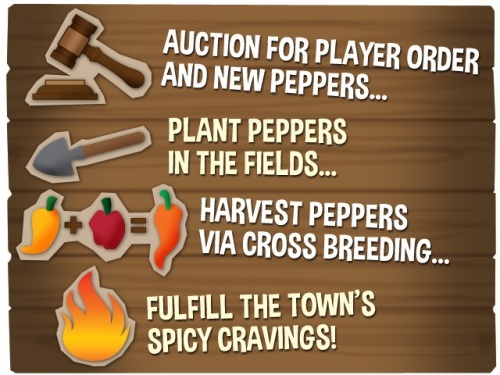 Bid for player order, plant 1 pepper that you own, walk your farmer around harvesting peppers, buy rewards with your peppers for points. Most points at the end wins. That’s the nutshell of it. While it’s easy to learn, your first or second play through will start to reveal some interesting strategies to keep in mind. For instance, the first player gets to plant first, but you reverse order (like Powergrid) to harvest, the go back to the first player normal order to buy points. This is where the strategy really takes place. You bid for player order in the beginning of each round, so you have to try and choose if you want to be the first to harvest, or the first to buy peppers. During harvesting you move your farmer 1-3 steps. You can’t double-back and you can’t walk through or land on another farmer. Blocking is everything. If you harvest first, you get to block where others go. This becomes very important later one. I lost my last game because I walked 3 steps when i should have walked 2. The third step got me a pepper I sold for $1 (or 1/3 a point at the end). If I had stopped on my second step, it would have blocked the next player from getting what she needed to beat me. The only complaint I have about the game is that the recipes are too far in the point spread. The last player to get a recipe is almost always the winner. I didn’t get the last recipe in the last game I lost, but I was 3 points behind the winner who did, so it’s possible this isn’t always the case. Still, it seems highly probable that the last recipe determines the winner. That’s fine if you keep that in mind. It’s a race for the recipes basically. Overall, it’s a very fun game. I highly recommend it for players who like light, fast paced euros. 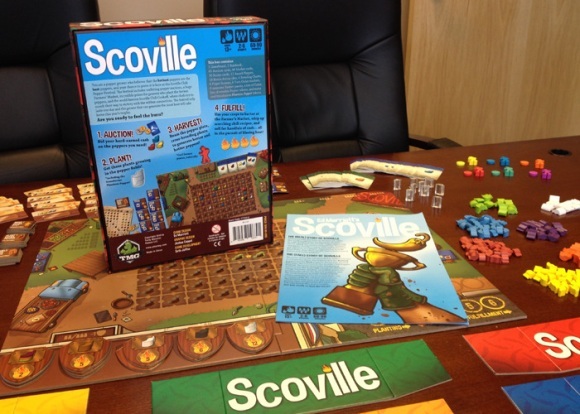 Add a Review for "Scoville"